Scroll through all the easy ways you can help support Odyssey! Every time you make a purchase at Publix have the cashier scan your Odyssey Publix Partners Card. Publix Partner cards are available in the lobby of the school. They can be used in AL, GA, TN and SC. We receive quarterly checks and for every $37,500 we collectively spend on groceries, the school earns $250. As of August 2018, we have earned over $3700 since May 2012. Way to go Tigers! Kroger has a program called Kroger Community Rewards. Every time you make a purchase at Kroger and they scan your Kroger Shopper Card, the school will earn a percentage of your purchase. All you have to do is register your Kroger Shopper Card to Odyssey! To register, please go to www.krogercommunityrewards.com. Sign in to your online Kroger account (or set up an account if you don’t already have one–it’s free and you can access coupons and other perks!) and then select Odyssey as your school. You can either search for us by name or use the Organization Number NT418. Invite your family, friends and neighbors to also enroll their cards for Odyssey. The more families we have enrolled the more funds we will receive! As of August 2018, we have earned over $2900 since January 2014. If you frequently shop at Amazon.com, have we got news for you! Odyssey is now registered as a charity with AmazonSmile! AmazonSmile is a website operated by Amazon that lets customers enjoy the same wide selection of products, low prices, and convenient shopping features as on Amazon.com. The difference is that when customers shop on AmazonSmile (smile.amazon.com), the AmazonSmile Foundation will donate 0.5% of the price of eligible purchases to Odyssey! All you have to do is follow the below link, sign into your Amazon account and begin shopping on AmazonSmile! http://smile.amazon.com/ch/58-2429902 This will reflect your selected charity as Community Education Association, Inc. (Odyssey’s corporate name.) Remember, you have to be on smile.amazon.com for the school to get credit. We will NOT get credit if you are on the regular Amazon website. But the two sites are essentially the same! E-Box Tops for Education – When you receive a 14-digit eBoxTops™ at checkout or on a package, you can redeem it at the link and Odyssey earns points. Please share the link with your friends and family members so they can also support Odyssey when they shop at a participating grocery store. Begin collecting box tops from participating products. Glue them to a Box Tops Collection Sheet or save them in a Ziploc bag. If you use a collection sheet, please glue the box top to the sheet (no tape or staples). Make sure you put your student’s name and teacher on your sheets or bag. Watch the daily news for opportunities to help us win or earn bonus points. Our lifetime earnings are almost $11,000 from Box Tops as of Fall 2016. Way to go! Every time you make a purchase at Office Depot, give them our 5% Back to Schools number: 70211843. Office Depot will give the school credit equal to 5% of all of our qualifying purchases in the form of an Office Depot merchandise card that can be used towards supplies for the school. www.officedepot.com/5percent for more info. You can now donate to Odyssey Charter School with your credit card and/or PayPal account. To make a gift to Odyssey Charter School, simply click on the button and you will be directed to the secure PayPal server. Please remember that your donation to Odyssey Charter School is tax-deductible. 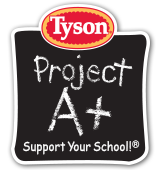 Our school is participating in the Tyson Project A+™ program, a fund-raising program sponsored by Tyson Foods, Inc. Through this program, we can raise up to $12,000 for our school this year! The money can go towards supplies, building improvements, school programs, or anything else we choose. It’s an easy way to raise much needed funds by sending Tyson Project A+ labels from products you probably already buy. Here’s how it works: Just clip and collect Tyson Project A+ labels from participating Tyson® product packages and send them to school with your child. We’ll collect the labels and send them to Tyson Foods, and Tyson Foods will send our school a check. Each label is worth 24¢! You can find additional details online at ProjectAPlus.tyson.com.